No ladder or stiff courthouse ceremony required. 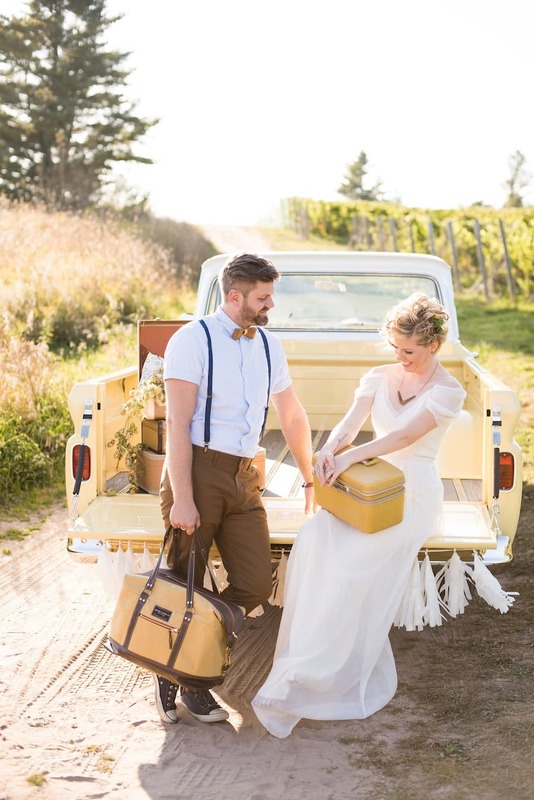 The trendy new take on eloping is a romantic, intimate experience between the bride and groom and perhaps a few close friends and family. 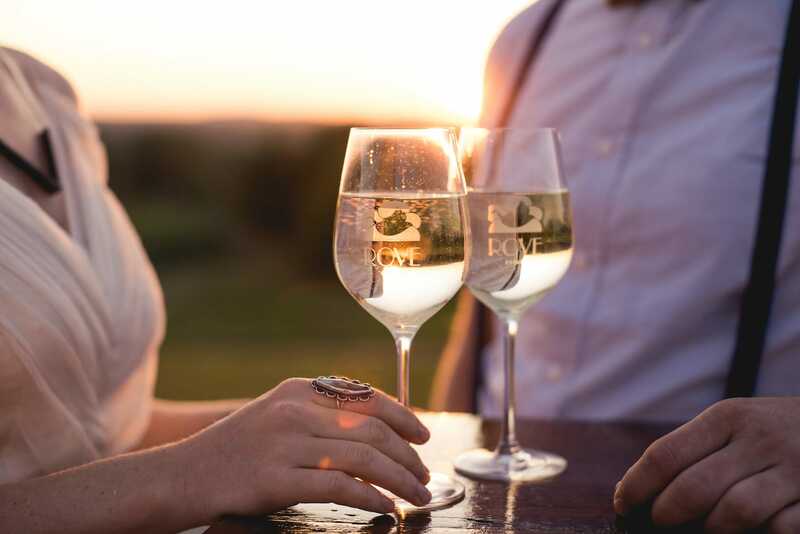 The serene beauty of a Northern Michigan winery is just the setting. 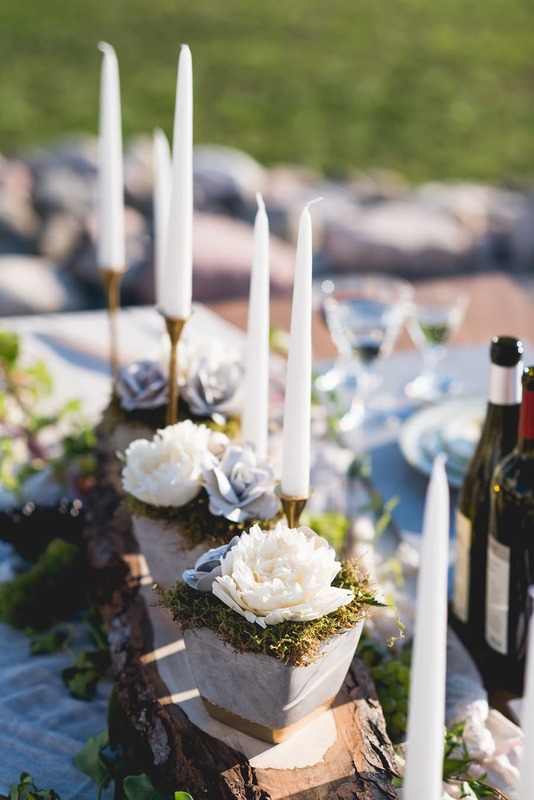 Want more ideas for a Northern Michigan wedding? Get your copy of MyNorth Wedding! 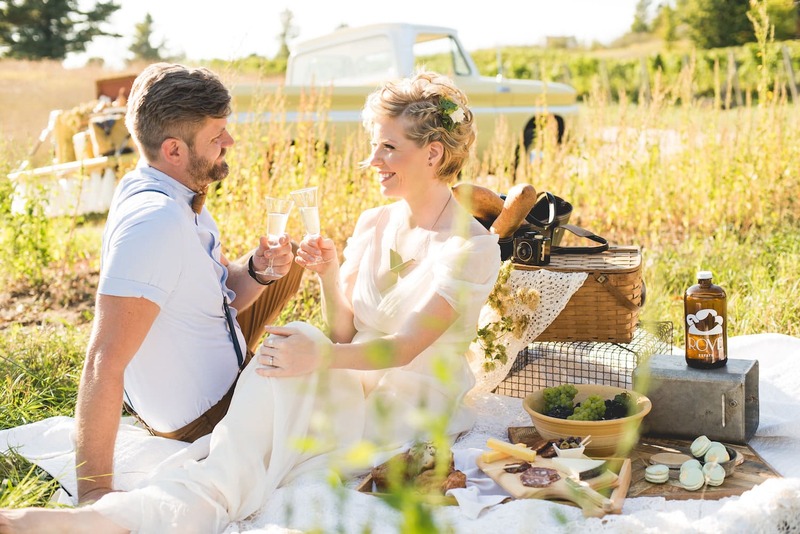 Event designer Meaghan Keck of Birch Affair, who orchestrated the elopement photoshoot, terms the style vindustrial—vintage meets industrial. 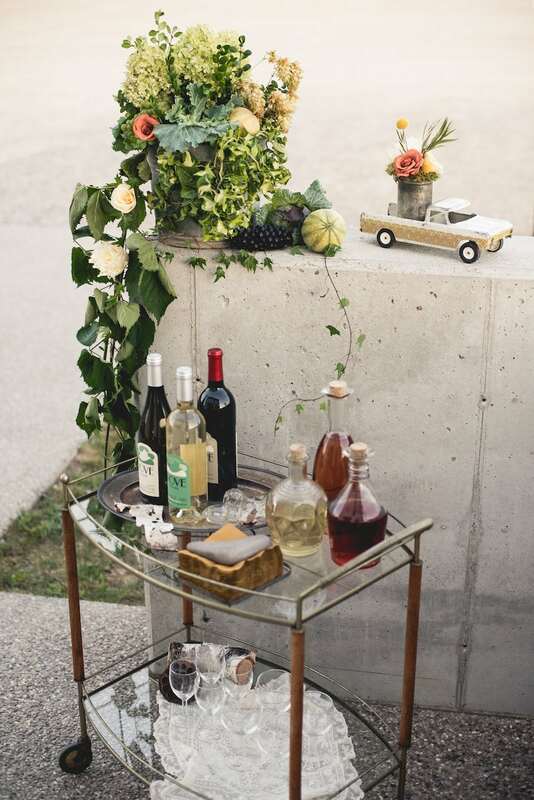 Thus the miniature truck holding an old tin can set on a cement wall and a 1965 Chevrolet instead of a limousine. 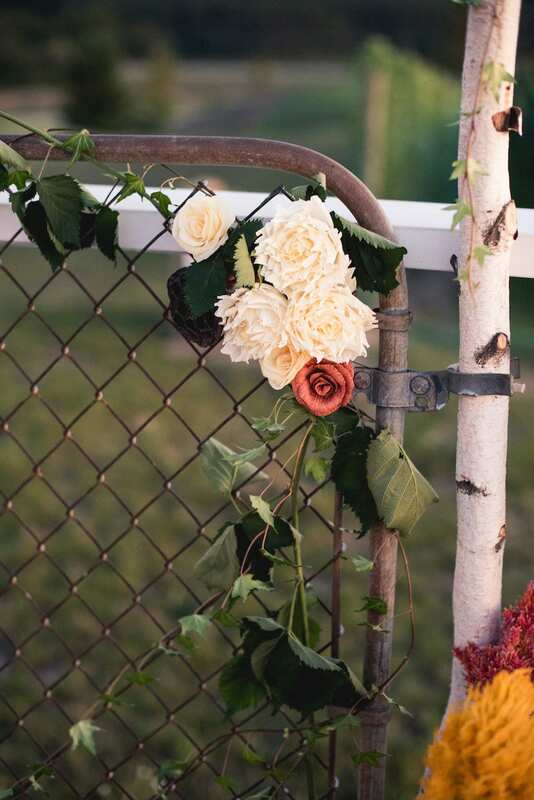 The bouquet is a wonderful medley of Northern Michigan hops, cabbage, blackberry vines, grape clusters (cut fresh from the vineyard) and, from downstate, hydrangea, ivy and mini melons. The flowers are paper, handmade by Keck. 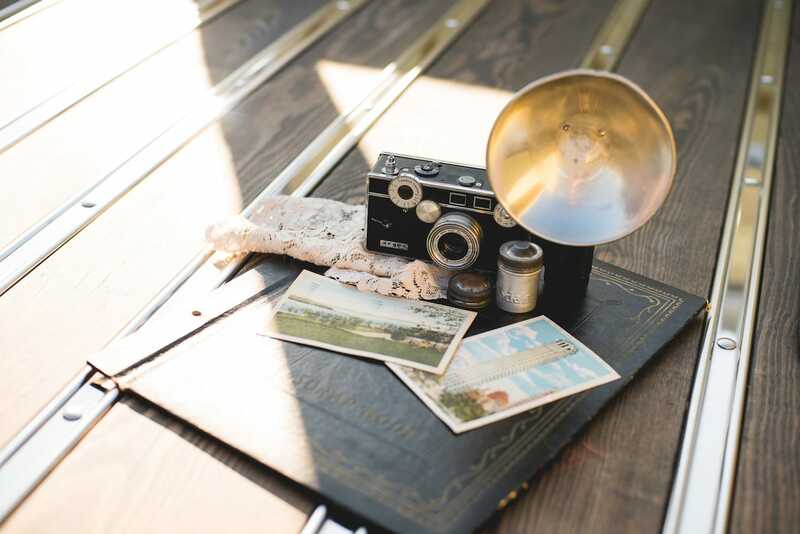 The shoot is made up of things that make Michigan special—nature, intimacy, and hardworking souls. “We have such a rich history of makers and doers throughout the state, and I wanted to incorporate vintage elements to represent creators who paved the way for us today and industrial elements to represent the grit that goes into being a Michigander,” Keck says. 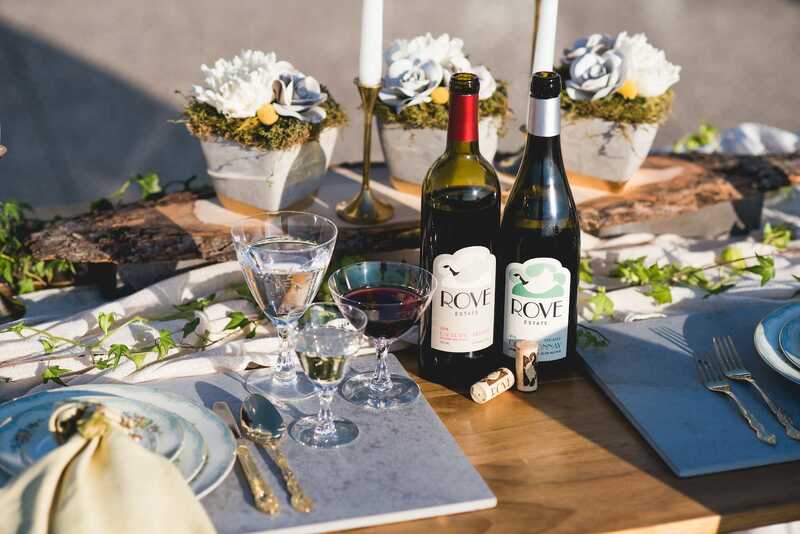 Rove Estate, a vineyard and tasting room in Leelanau County, was the setting for the shoot. 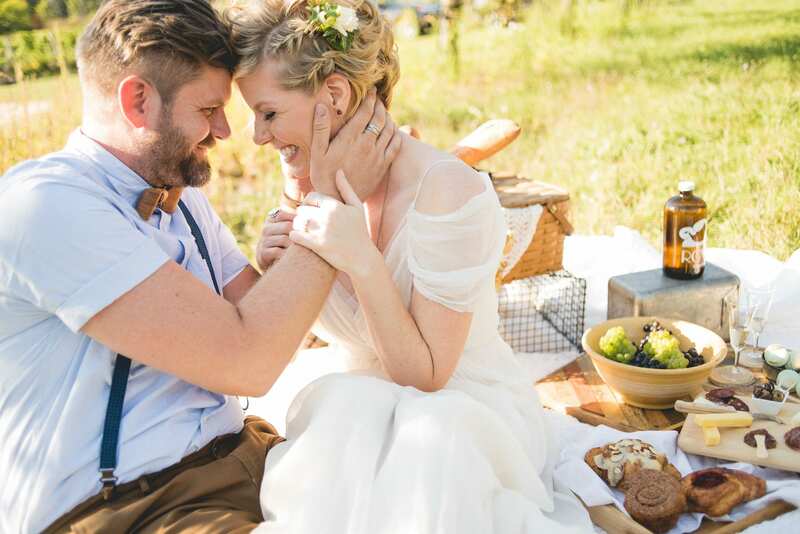 The retro wine bar set the mood for the ceremony, and offered beautiful views of the surrounding countryside—the hilltop tasting room is set on the highest elevated point in the county. 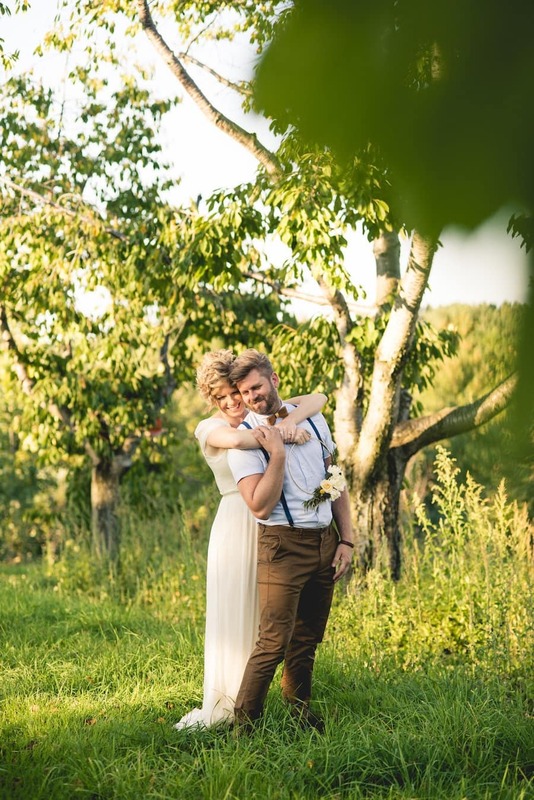 “Whether a couple wants a ceremony just for themselves or a small gathering of a few loved ones, I wanted to showcase what an elopement celebration could look like for those desiring certain aesthetics of a traditional wedding with a completely unconventional twist,” Keck says. 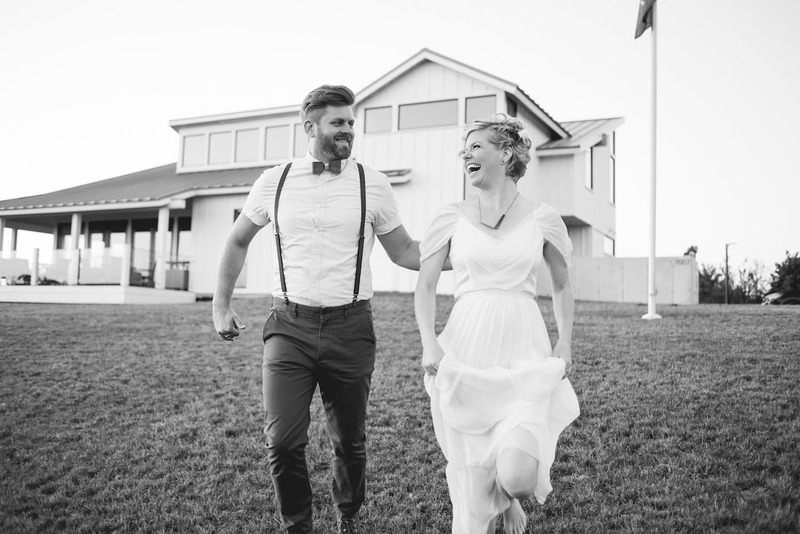 Elopement has its proper etiquette: paramount being a thoughtful wedding announcement to friends and family that makes them feel included in the new life you are building together. 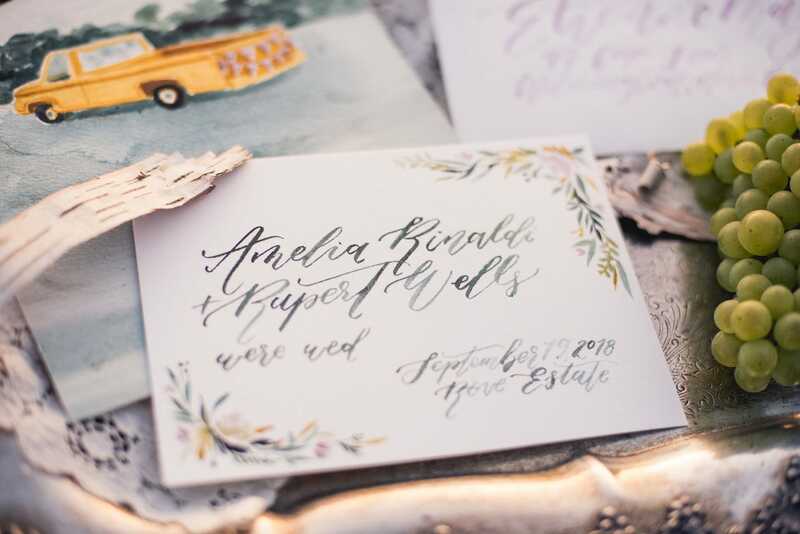 The hand-painted, water-colored announcements shown below are by Sable and Gray of Traverse City. 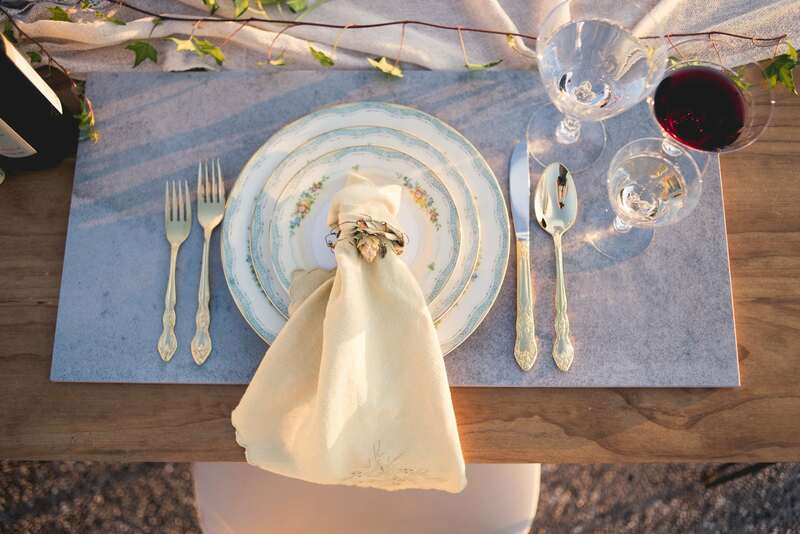 A cement tile-placement grounds the industrial side of the vindustrial theme, while the vintage place setting speaks for itself. The napkin is vintage too, but it was hand dyed using a natural goldenrod dye by the Detroit-based business Color Wheel. 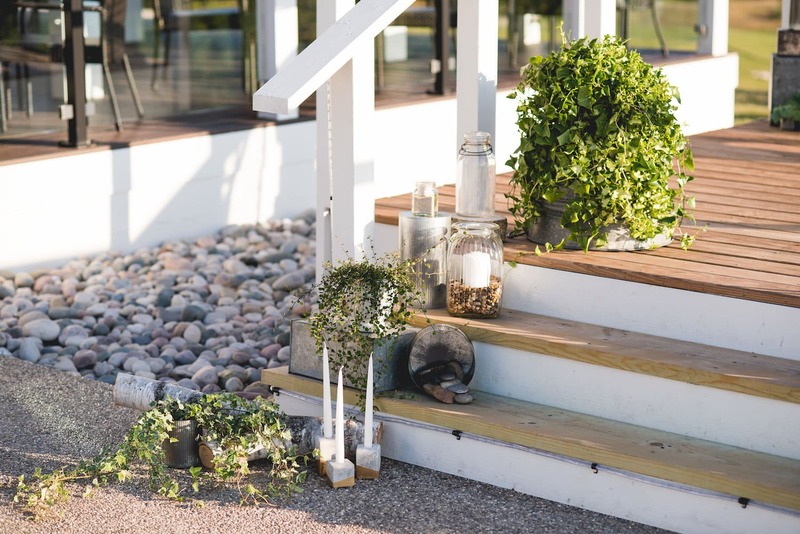 It’s just one of the ways Keck incorporated mindful and sustainable elements into the shoot. 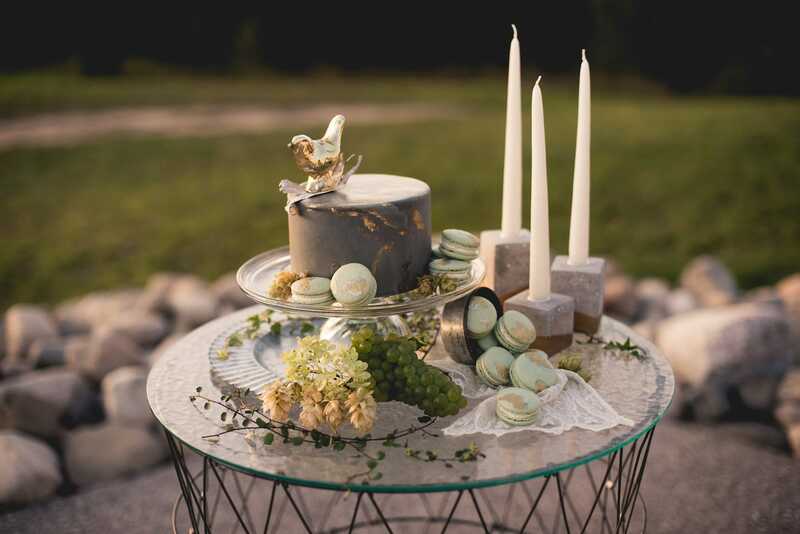 Pale green and gilded macarons and a purple-gray cake made by Detroit’s Whisk and Crumb evoke the colors of harvest time at a winery—as do the freshly picked grapes from the vineyard. 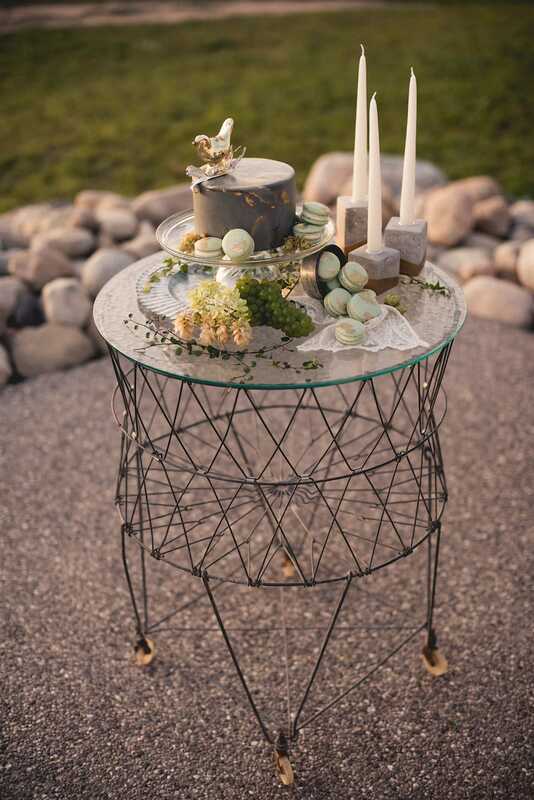 The soft vintage lace, found at a garage sale, contrasts with the cement candlestick holders. Keck used a vintage laundry hamper for the cake table. “I love using items in nontraditional ways,” she says. The paper for the gray flowers made by Keck is from Paperworks Studio in Traverse City. 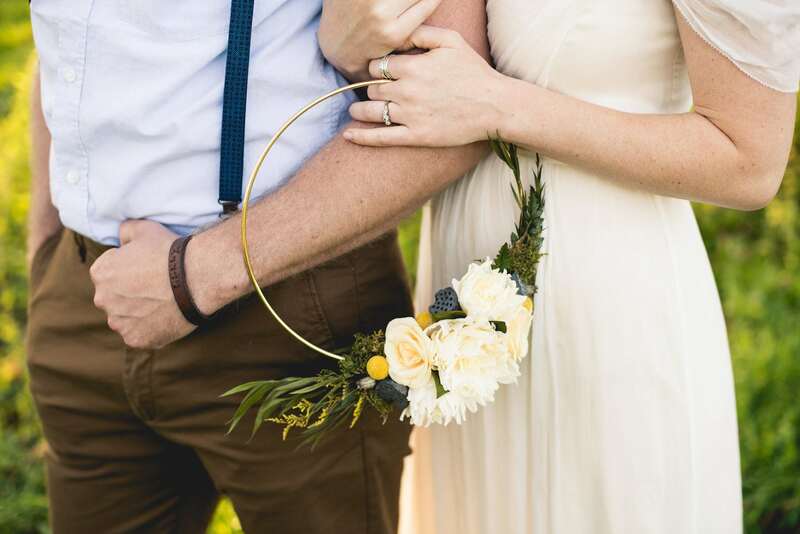 Made from paper flowers and preserved greenery, the hoop bouquet, also made by Keck, can be displayed on a wall for years to come. 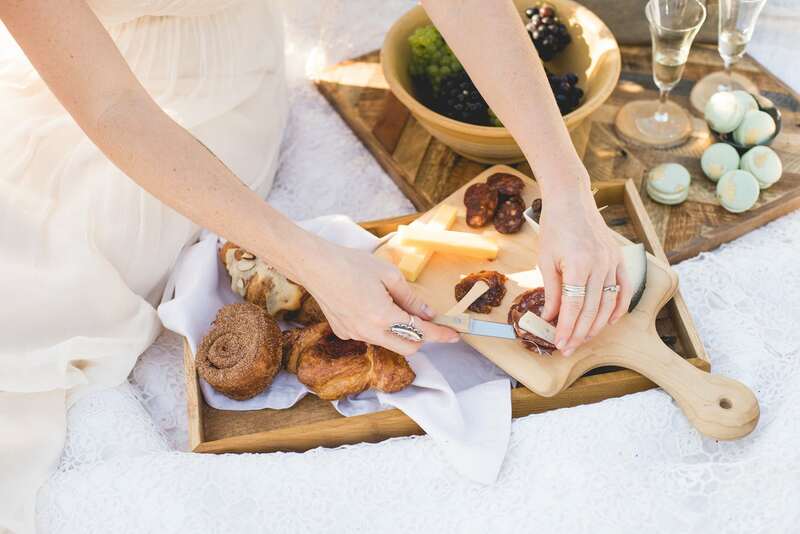 An afternoon picnic sets the relaxed mood for the later low-key ceremony and dinner. 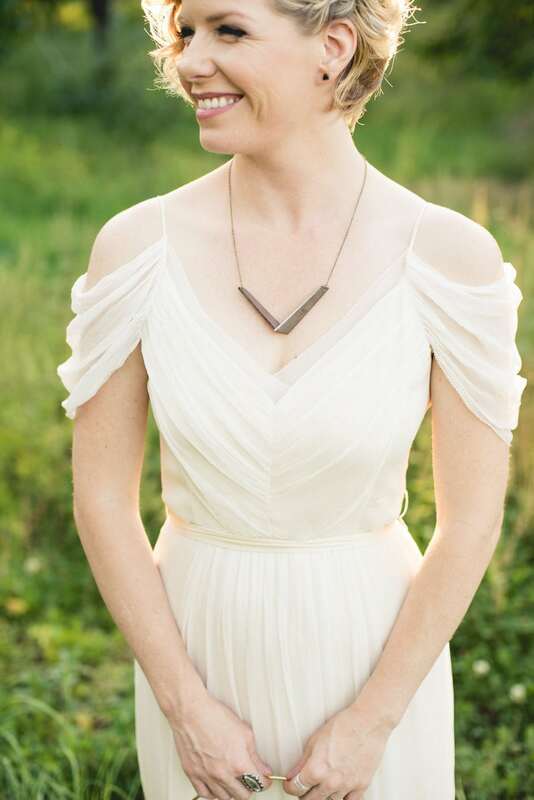 The bride’s hair and makeup are by M.O. Hair and Beauty Lounge in Traverse City. M.O. Hair, a certified Greencircle Salon, utilizes environmentally friendly practices. 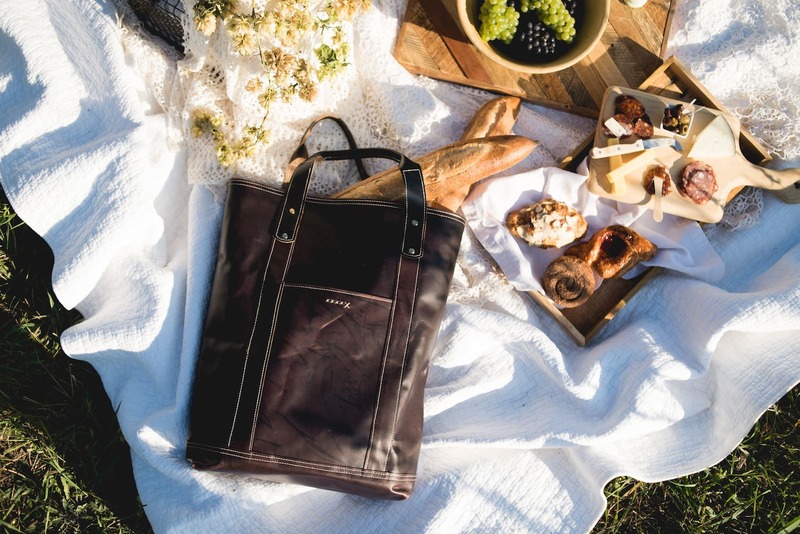 The leather bag is handmade in Traverse City by Michael Wahlstrom, owner of Gitchee Gumee Co. Pictured below is the Isle Royale Samantha Bag. Vintage postcards from Traverse City and Detroit showcase the vindustrial theme in a fun, simple way. 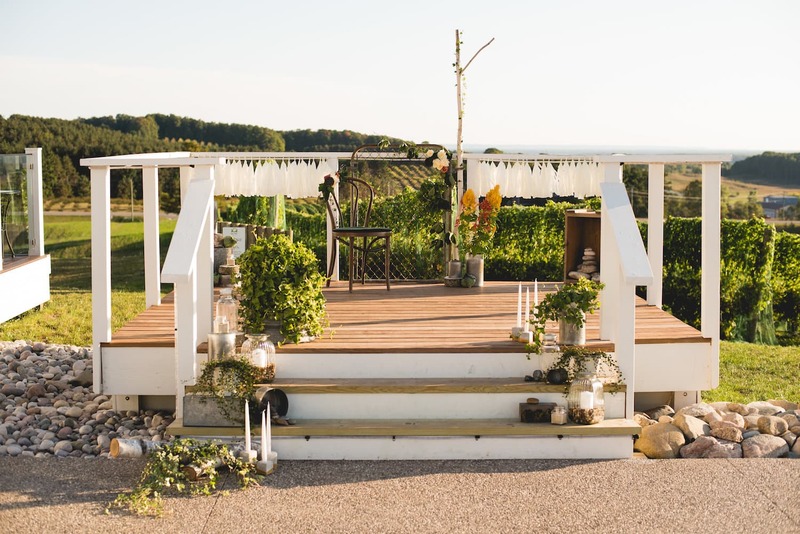 An outdoor deck at Rove Estate was the perfect spot for an altar. Forego the traditional bowtie, and opt for one with a modern twist. 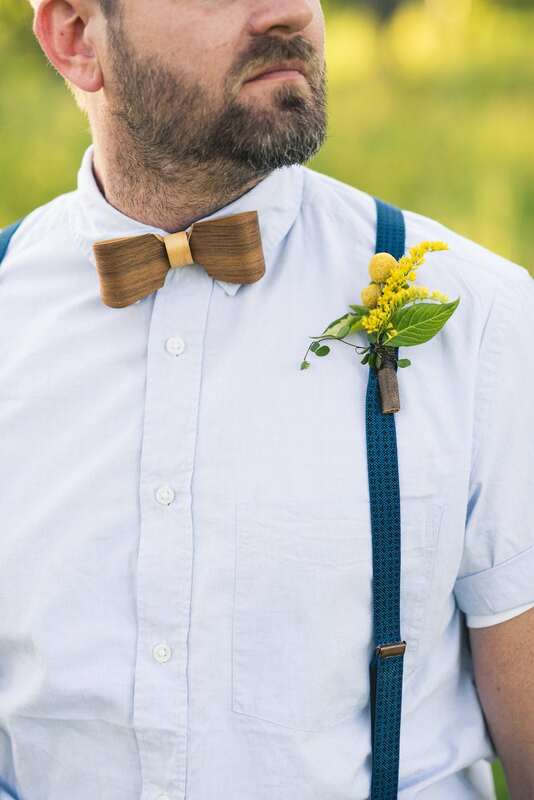 This wooden bowtie was made by Four Chamber Forge.